The information provided below should help you decipher the correct path to get on to become an insurance agent. Or if you already are one, and would like to become your own boss, by working independently as a broker, then read below to more information. 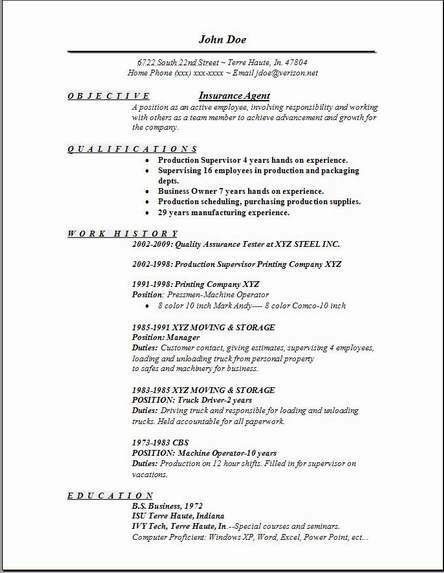 We have provided above, useful formats for you to change up your old resume and re-new it. 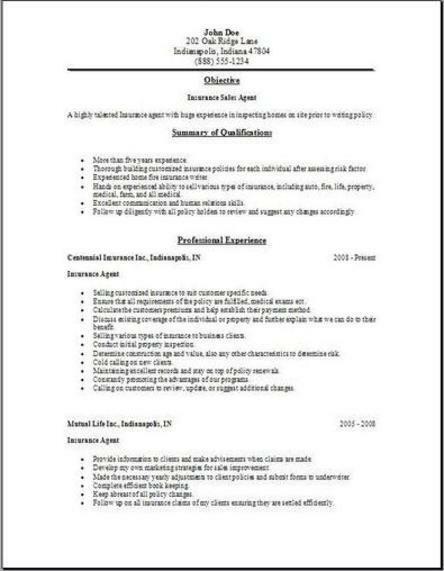 These 3 insurance agent resume formats above need to be edited replacing the existing information after you download them with your personal work history. Just backspace the sample you have downloaded, then substitute all of your original info. Its east to compare the three by editing all of them, and then you can begin the task of deciding the best format for your own situation. It's so very easy. This is a super fast way for us to help you create your new resume, less than an hour you will be done. 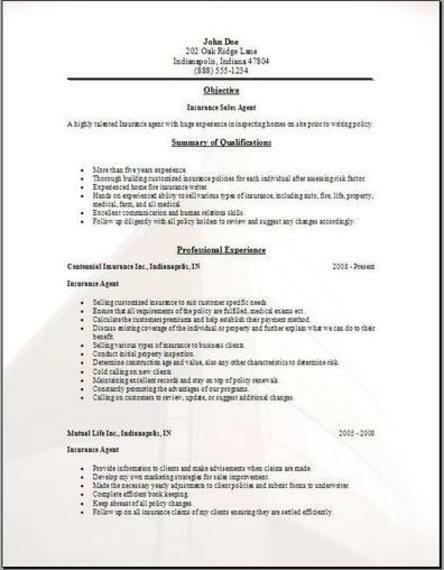 I find these free insurance agent resume examples very useful. All that's needed is for you to backspace and then edit. Go find out what some of the styles are on the other pages, because you can also add those different styles to your own resume easily. Adding something you like from those to yours is a great idea. So just make the example your very own today, super quick and also easy. So you would like to be an insurance agent. There are many interesting areas to choose from. So if you don’t have any desire to be associated with a particular insurance company, then why not consider becoming your own independent agent. It will be definitely a great idea to work for another insurance agent or a broker at first, since it is harder to get contacts when you are first starting out. After you complete that, you should start to concentrate on starting your own business. Many states will require that you prove your residency at least in the particular state where you wish to be an insurance agent. You will also need to be 18 years of old, required by state. If you wish to be a insurance broker, you need to accumulate 2 years experience or preferably more, before you start thinking about getting your broker’s license. Although it can be very difficult to be your own independent auto insurance agent, and work for yourself, in the end, all that hard work will pay off with (profits). All independent agents know the best out of several types of polices, then they will provide their client a great policy to fit their customer’s needs. Depending if you decide becoming your own independent auto insurance agent, the company would then pay for the licensing fees for you and also the finger print final bill. If you do decide to be an independent and work for yourself, then you will have to cover your own cost. All states are really reasonable in regards to the licensing initial fees. Possibly $50 is all it would take you to get your license so you can start selling insurance in almost any state. No states require you to have a minimum level of education, if you currently have a GED or better yet, your high school diploma, you can turn in your own paperwork anytime you are prepared. The various states that may require that you take their test for insurance are not many at all, and most states will let you come back in and re-take their exam, even several times. They do not have a penalty at this time for failing.